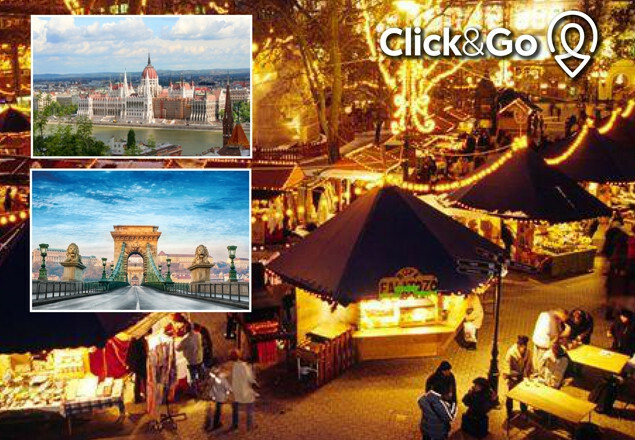 We have teamed up with Click&Go to offer you this amazing, 5* Christmas Market offer to Budapest. We are offering a 5* 3 night city break for two people to Budapest in Hungary. The offers includes return flights, return airport transfers, 3 nights 5* central hotel with breakfast each morning. Architecturally stunning, there is a happy mixture of neo-classical, baroque and art nouveau buildings, so it is no exaggeration to say the city is visually interesting. Some of the gems that make it a UNESCO World Heritage site are Andrassy Avenue, the banks of the Danube, Buda Castle quarter and the Millennium Underground Railway (the oldest in the world). In winter, Budapest looks incredibly beautiful as the Danube often freezes over and the city takes on a mantle of snow like an ermine cloak. Open-air thermal pools give a special winter bath experience. This is also the time to visit a Budapest Christmas market, where you can savour the scent of traditional honey cookies, cinnamon and fir, sip some mulled wine and soak up the festive atmosphere. A jewel in central Europe, Budapest is the most magical and loveliest of cities, no matter what time of year you visit. Once confirmed by ClickandGo full cancellation charge applies.